Photo Credits to my friend, Atrin Assa. I love to look through cooking magazines. Elegantly prepared dishes placed right in front of you waiting for you to drool all over the pages, always makes my stomach rumble hungrily. While I love to read these magazines and look at pictures, I rarely actually make a recipe from them. While flipping through a Martha Stewart magazine at my moms house a few months back a recipe caught my eye–something that looked delicious, totally doable and just up my alley. 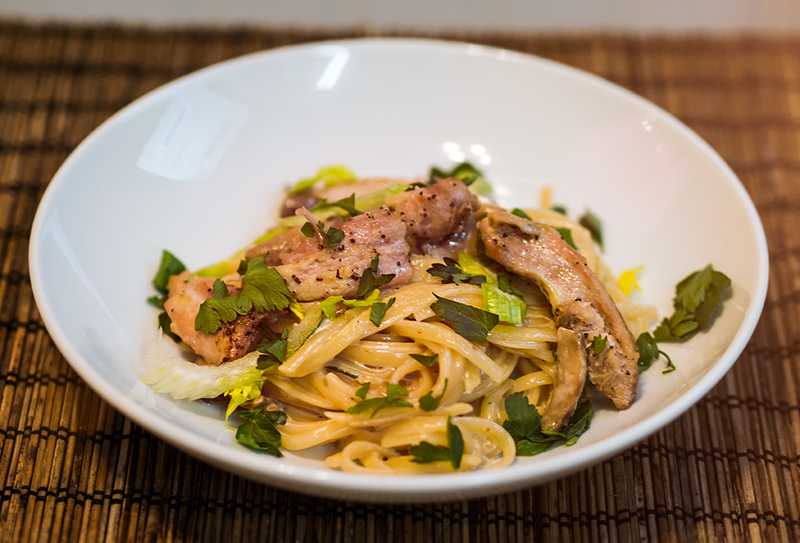 Martha's chicken and mushroom tagliatelle really is fantastic. The dish is all about building on flavors. First, you cook the chicken to a nice golden brown and after it's cooked you add mushrooms and shallots to the same pan and let them slowly render their juices off to deglaze the pan and work a bit of magic. Then you add cream, parmesan, pasta (you know all the good things in life), some celery and parsley to add a little fresh crunch to all this richness and finish it off with the golden chicken. When we tasted this dish the first time, we thought we had died and gone to heaven. The second time I learned that you really do need to eat this as soon as you make it. It was still fantastic but it did lack that choir of angels we had experienced the first time around. I used boneless, skinless chicken thighs in my dish as I really like dark meat but I know there are many people who do not like dark meat. You can easily use thin chicken breasts in this. 1. Cook pasta in a large pot of generously salted water until al dente. Reserve 1 1/2 cups pasta water. Drain. 2. Season chicken with salt and pepper. Melt 1 tablespoon butter in a large skillet over medium-high heat. Brown chicken, flipping once, until cooked through, 6-8 minutes; transfer to a place. Reduce heat to medium; melt remaining 1 tablespoon butter. Cook shallots and mushrooms, stirring, until golden brown, about 8 minutes (you may need to add a little pasta water if the skillet browns too quickly). Add stock, bring to a boil, and reduce by half. Slice chicken; add to pan with cream, parmesan, 1 cup pasta water and pasta. Toss until sauce coats pasta, adding more pasta water if needed. Add celery and parsley; toss to combine. Serve topped with parmesan.